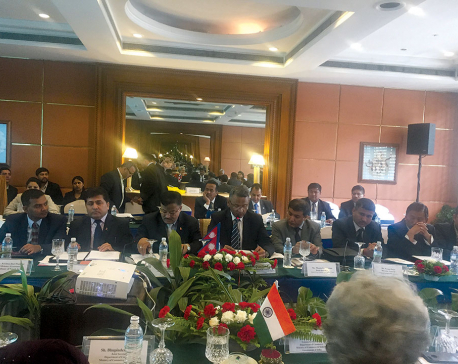 KATHMANDU, Jan 16: In what is described as giving momentum to sub-regional motor vehicle agreement, Nepal, India and Bangladesh have agreed on the text of operating procedures for passenger vehicle movement in the sub-region under the Bangladesh-Bhutan-India-Nepal (BBIN) Motor Vehicles Agreement (MVA) signed in June 2015. A meeting of Nepal, India and Bangladesh held recently in Bengaluru, India, also decided to soon complete the internal approval processes for signing the passenger protocol, while also agreeing to conduct more trial runs for cargo vehicles under the agreement, according to India's Ministry of Road Transport and Highways(MoRTH). High-level officials of the three countries discussed an implementation of the MVA at a meeting in Bengaluru on 10-11 January, convened and chaired by MoRTH. A Bhutanese official delegation also attended the meeting as observers. The MVA was signed by Transport Ministers of the BBIN countries in Thimphu, Bhutan on 15 June 2015. Trial runs for cargo vehicles under MVA were conducted along the Kolkata-Dhaka-Agartala and Delhi-Kolkata-Dhaka routes. The trials were successful in establishing the Agreement's economic benefits, it is stated. Bangladesh, India and Nepal have already ratified MVA and agreed to start its implementation among the three signatory countries, with Bhutan joining after it also ratifies the agreement. "I am encouraged by the strong commitment of the BBIN countries to move forward on the MVA initiative", a press statement issued by MoRTH, quoted. Dakshita Das, MoRTH Joint Secretary and chair at the Bengaluru meeting, as saying. "India will do its best to make the MVA successful, making it a key instrument in accelerating cross-border trade and economic integration in the sub-region." The Asian Development Bank(ADB) has been providing technical, advisory and financial support to the BBIN MVA initiative as part of its assistance to the South Asia Subregional Economic Cooperation (SASEC) program, a projects-based economic cooperation initiative that brings together the BBIN countries, Maldives, Sri Lanka and more recently, Myanmar. Meeting participants who included delegations led by Keshab Kumar Sharma, Joint Secretary from the Ministry of Physical Infrastructure and Transport of Nepal and Safiqul Islam, Additional Secretary from the Ministry of Road Transport and Bridges of Bangladesh, agreed the text of the passenger protocol, the document detailing procedures for cross-border movement of buses and private vehicles, to be signed by the three countries after completing necessary internal approval processes in their governments. The delegations also agreed to continue to conduct a trial movement of cargo vehicles along scheduled routes from April 2018 onwards, before finalizing the protocol for cargo vehicular movement. All participating country delegations described the meeting as a major milestone in regaining the momentum of transport facilitation in the sub-region.